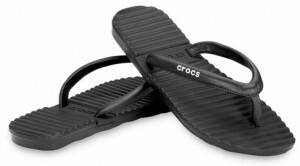 Crocs: Women’s Wake Flip Flops Only $11.99 Shipped! You can score these Women’s Wake Flip Flops from Crocs for only $11.99 for today only. There is a new Memorial Day Sale 20% off discount code that is good through 5/31 however the Women’s Wake Flip Flops are the Deal of The Week at only $14.99 (org $29.99). That part of the sale ends today. Plus there is free shipping. So after sale and 20% off coupon, you will pay only $11.99 shipped. Also, there are the Holiday Flip Flops & Laguna Flip Flops (which I happen to be wearing today) at only $7.99 after discount. Sized are very limited on this style. You can head here to check it out. Search for Wake or Holiday and use coupon code: MEMORIAL20 at checkout.